BMW is at work in the Car Industry Strikes Back series. Sporty cyclists featured in the background. 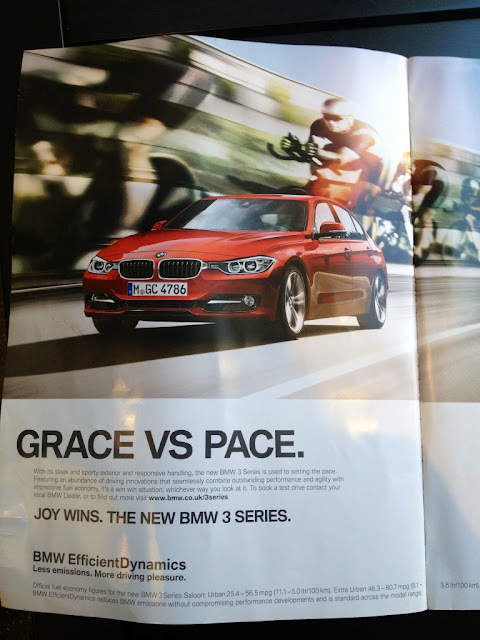 The text "Grace vs Pace" is prominent. But which is which? Does the car have pace and the cyclists grace? Or vice versa? We're not sure. But the point is clear. Joy wins. The joy of driving a BMW far exceeds riding a bicycle. And now their calling it Efficient Dynamics. Less emissions. More driving pleasure. Greenwashing supreme. Thanks to a follower on Twitter for the link.